All too often now, valves are becoming difficult to obtain, invariably leading to increased prices when you can find a source of supply. The circuit below was specifically designed to replace an OB2 regulator in a completely redesigned and rebuilt Heathkit SB301. The result is a solid state 150v 10mA regulated supply for the original valve VFO - one of the few original items left in the receiver. The entire circuit as shown above was built on a two inch square piece of single sided PCB with 'U' shaped, pre-drilled, black anodized, aluminium heatsinks for TR1 (large) and TR2 (small). 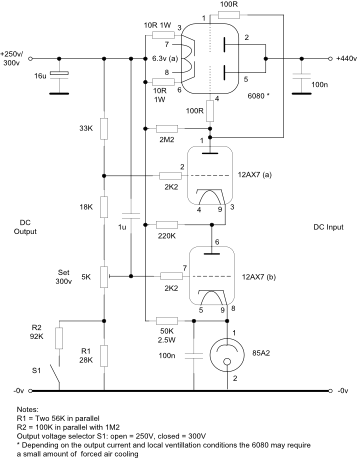 The circuit has performed faultlessly for many years and appears insensitive to a local 100W HF transmitter. The author used an MJE340 for TR2 as it was to hand but a TO5 encapsulated high voltage transistor with a small heatsink would work just as well. It is suggested that a bright red 'Warning, High Voltage' paper or plastic label be installed on the completed PCB to prevent accidents with the high voltages present. 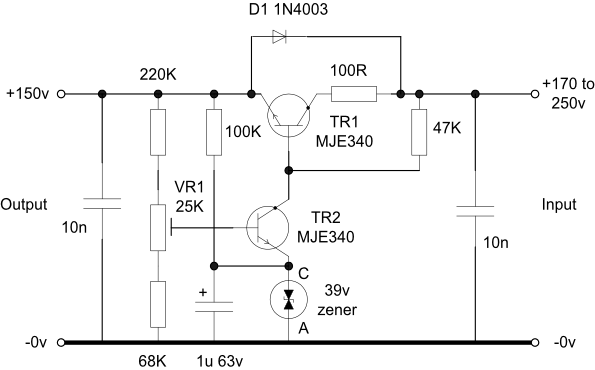 Use an emitter follower between TR2 and TR1 using an MJE340 or equivalent device with a small heatsink and add a base-emitter resistor to TR1 of about 100K. Also use a peak current limiting resistor of about 100R in series with the collector of the additional device. Increase the size of the heatsink on TR1 to allow for the extra dissipation. A higher voltage zener diode may be used but the divider network around the 'Set O/P' control will need to be recalculated, the 100K series resistor reduced to maintain a minimum zener current and the zener decoupling capacitor rating checked for adequate working voltage. The zener voltage should not exceed about two thirds of the required ourtput voltage. Current limiting, although possible, has not been attempted and has not proved to be necessary to date. This circuit is used to provide a regulated 300V supply in a homebrew version of a Heathkit HP23 PSU. The 6AS7 is an equivalent to the 6080 low Ra dual triode. Individual isolated heater supplies are required for the 6080 and 12AX7 because of the high voltages on each cathode and the limited heater cathode break down voltages. Grid stoppers have been provided to aid the high frequency stability and ensure that the circuit is not affected by the present of local RF fields. Plenty of ventillation is required for the 6080 and a small computer fan could be used to quietly move the air around this valve. A surge limiter is used with the PSU to control the inrush current at switch on - see elsewhere on this site for details.